An off-duty pilot in the cockpit of a Boeing 737 Max 8 jet jumped in to help crew disable a malfunctioning flight-control system as it experienced difficulties. The next day, with a different crew, the same plane crashed into the sea off Jakarta, killing all 189 people. An off-duty pilot in the cockpit of a Boeing 737 Max 8 jet jumped in to help crew disable a malfunctioning flight-control system as it experienced difficulties in October, according to Bloomberg. On doomed Lion Air Flight 610, pilots searched in a handbook for a way to stop the plane from nosediving, according to an exclusive Reuters report. Indonesia’s National Transportation Safety Committee (KNKT) has refused to comment to CNN on the content of the voice recorder as the investigation is still ongoing. Boeing also refused to comment to CNN on the matter Wednesday. The revelation that an extra pilot saved the plane the day before the crash has never been reported before, according to Bloomberg. “It could well be that the flight is full and he needs to get back to Jakarta — so as long as he is authorized to do so — then it’s absolutely fine,” he said. However, the presence of the third pilot in the cockpit did not appear in the National Transportation Safety Committee’s (KNKT) November preliminary report into the crash. Soerjanto Tjahjono, the head of KNKT told CNN on Wednesday they were not aware of the details in the Bloomberg report. CNN continues to reach out to more officials at the KNKT. Indonesian authorities confirmed that the plane’s angle of attack (AOA) sensor was replaced after a flight from Manado, in North Sulawesi to Denpasar, Bali on October 28. The Boeing 737 Max 8 then made another flight to Jakarta that same day, and the pilots reported further problems. The AOA sensors send information to the plane’s computers about the angle of the plane’s nose relative to the airflow over and under the wings to help determine whether the plane is about to stall. Software installed on Boeing’s 737 Max 8 planes, called the Maneuvering Characteristics Augmentation System (MCAS), automatically lowers the nose of the plane when it receives information from the AOA sensors that the aircraft is flying too slowly or steeply, and at risk of stalling. A preliminary KNKT report said the crew of Air Lion Flight 610 struggled to override the plane’s automatic systems in the minutes before it plunged into the ocean. The system pulled the plane’s nose down more than two dozen times, the report said. The report said the MCAS system was responding to incorrect data transmitted by an AOA sensor. A different flight crew experienced the same issue on a flight from Denpasar to Jakarta the previous day, but had turned off the MCAS and took manual control of the plane, the report said. Once in Jakarta, a Lion Air technician checked the plane again and gave it the green light to fly on its final flight, from Jakarta to Pangkal Pinang on the Indonesian island of Bangka. Experts have pointed to similarities between the Lion Air crash six months ago and last week’s Ethiopian Airlines crash, which killed all 157 people on board. Both were Boeing 737 Max 8 planes that were equipped with the same automated flight software and both crashed minutes after takeoff. 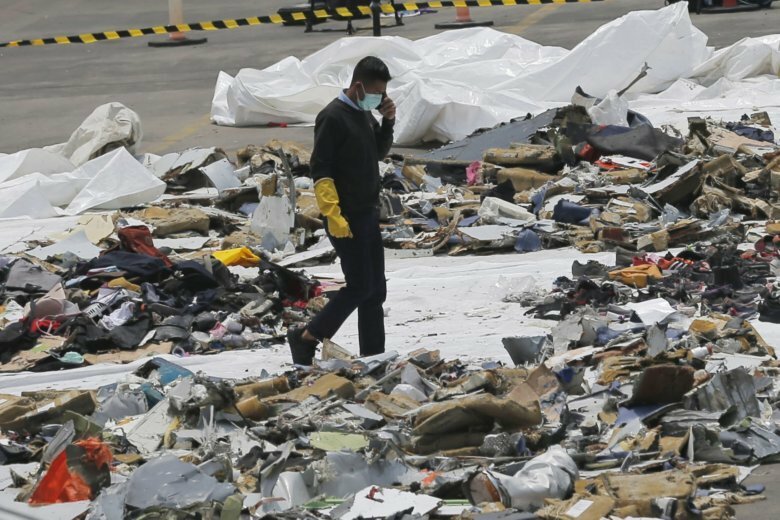 The Ethiopian Minister of Transport said preliminary data recovered from the black boxes of the crash in Ethiopia showed similarities to the Air Lion crash. But the investigation is ongoing.